Gingerbread Cracker Toffee: Tastes like Gingerbread Twix. Now, go forth and make some immediately. Wow, what a year it’s been. My husband and I went on our honeymoon in May (for which I packed Spicy Spam Musubi). 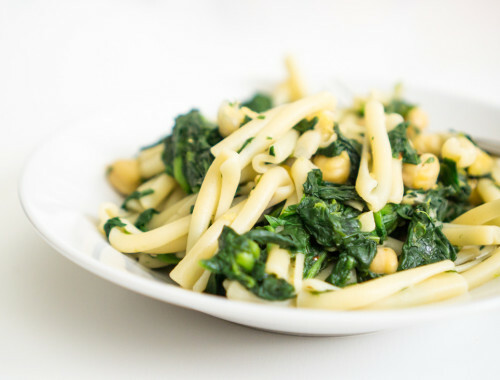 Shortly thereafter, I lost my appetite for months…because I got pregnant! I never dreamed that my eating habits would be interrupted by the nausea that left me couch-bound for the first trimester, nor by the severe aversions that lasted through second trimester. I was also shocked to discover that I developed a huge sweet tooth. My husband once met me at a doctor’s appointment and, before saying a word, handed me a bag containing two doughnuts. (Yes, I know he’s a keeper.) So, although I didn’t cook much since I got pregnant, I decided to experiment with cookie recipes around the holidays this year. 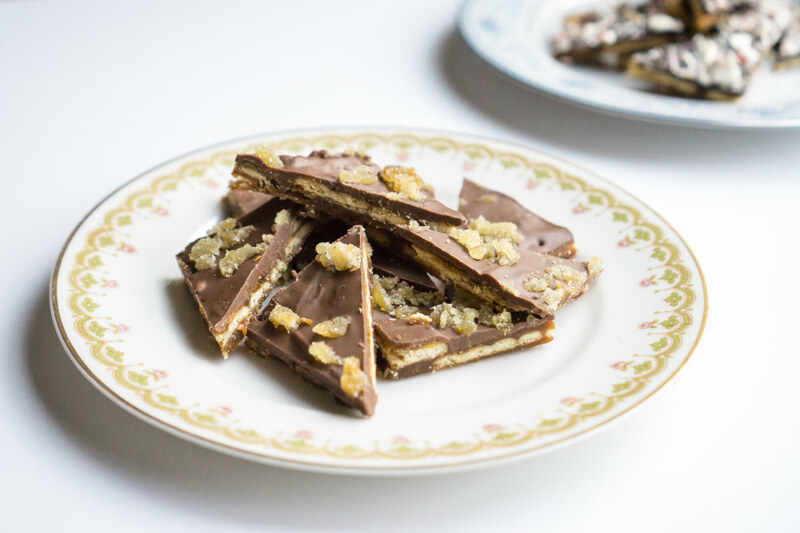 I ended up developing this gingerbread cracker toffee recipe from a basic saltine toffee recipe. 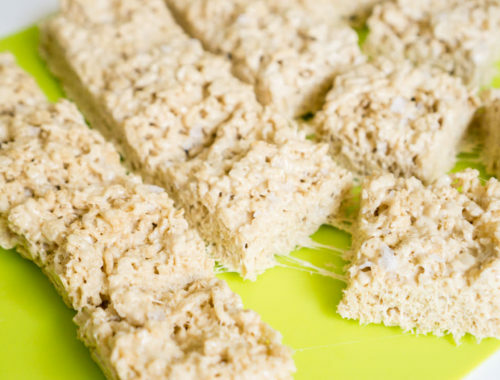 Not only does it satisfy my pregnancy sweet cravings, but it also takes less than 20 minutes of active time to make. Now that we’ve gotten the formalities out of the way, let’s talk about this recipe in detail. 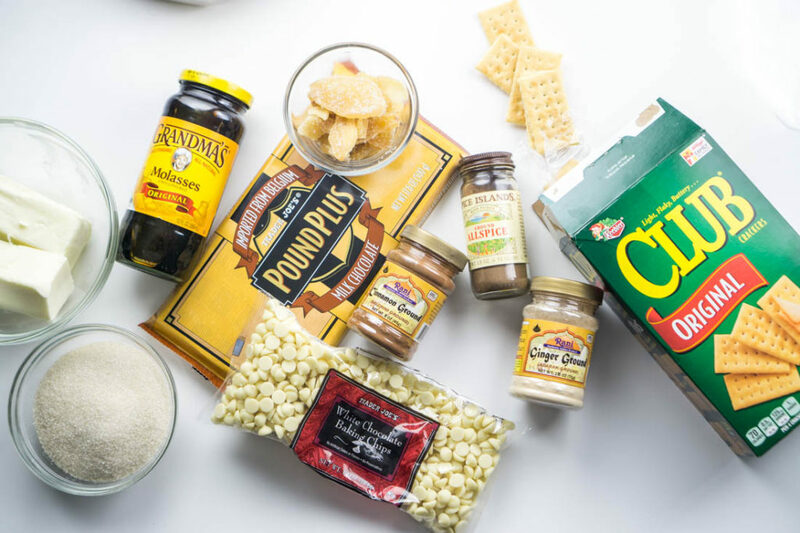 I love the basic idea of saltine toffee. I love the way that this cookie-candy hybrid slyly elevates and transforms a humble cracker that is usually relegated to the sickroom into a buttery, decadent snack. 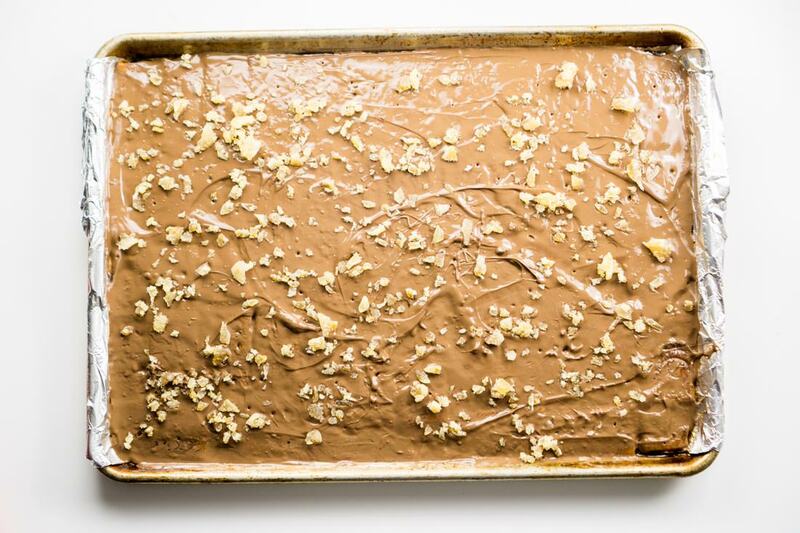 But when I actually made toffee with saltines, I…didn’t quite love it. I didn’t love that it was shatteringly crispy all the way through. Most of all, the flavor tasted a little off to me. Don’t get me wrong, I ate the whole pan of saltine toffee…but the fact that the saltine tasted so indelibly saltine-y meant that it never successfully transmuted into crunchy cookie toffee. It just tasted like its individual components: toffee, chocolate, and saltines. I suspected there had to be a better way to make cracker toffee. After some Googling, I discovered that there were creative cooks experimenting with different crackers in their cracker toffee. There was toffee made with Ritz Crackers. Toffee made with graham crackers. But the version that intrigued me the most…was cracker toffee made with Keebler Club crackers. I had never before tried Keebler Club crackers. I’d seen the familiar green boxes in the grocery store, but they always looked like some variation on Ritz Crackers, which I’ve never really liked because they were too sweet, flaky, and greasy to satisfy my cracker cravings. But once I opened up my first sleeve of Club crackers and started munching away, I started getting excited. 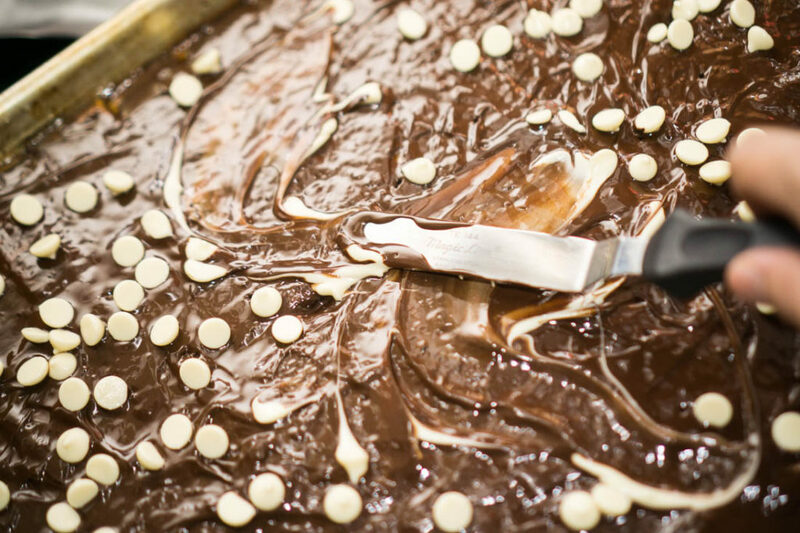 The butteriness would be a perfect complement to the rich toffee and chocolate. I also wondered why few people seemed to be making cracker toffee in anything but the basic flavors – toffee, chocolate, and nuts. The variations that I saw usually involved many extra steps, such as making a separate marshmallow fluff topping. While I love layered bar cookies, I also wanted to preserve the ease of the basic recipe. How could I create a version of cracker toffee that would stay true to the easygoing nature of the basic recipe, while allowing me to try out different flavors? I decided to experiment with flavoring the toffee with various spices. It being December at the time, gingerbread toffee seemed like a natural extension of cracker toffee. 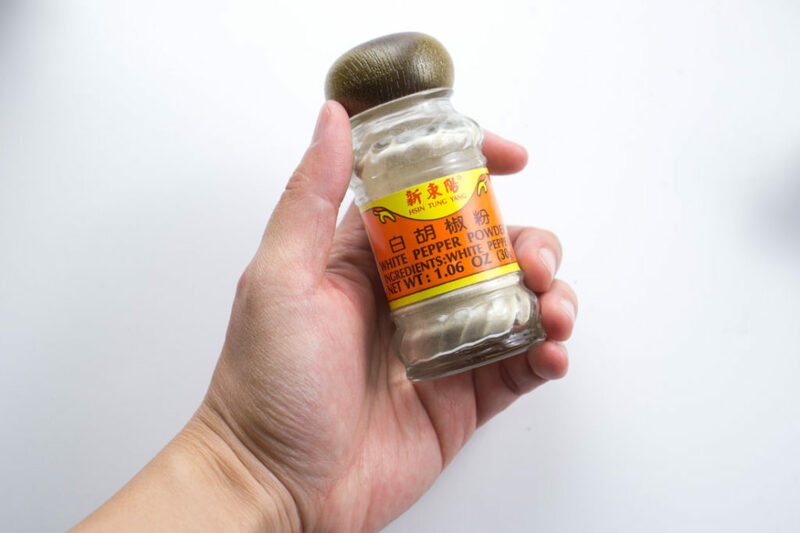 I used basic gingerbread cookie spices, adding some white pepper for subtle heat. Milk chocolate instead of dark would complement, rather than overpower, the warm spice notes. I loaded up the basic butter-sugar toffee mixture with extra molasses and enough winter spices to make a German grandmother happy. After boiling the mixture for three minutes without stirring, I quickly spread it over the Club crackers, briefly baked the cracker-toffee mixture in a very hot oven, and immediately sprinkled it with the milk chocolate chunks. The residual heat from the hot toffee melted the chocolate in a matter of minutes. Sprinkling the melted chocolate with candied ginger added a pretty decorative touch and also underlined the strong ginger notes in the toffee. And if gingerbread is not your favorite flavor profile, or if you just want to switch it up, you can swap out the milk chocolate for dark, and the candied ginger and spices for crushed candy canes. For the candy cane variation, swirl in some white chocolate chips to the melted dark chocolate. 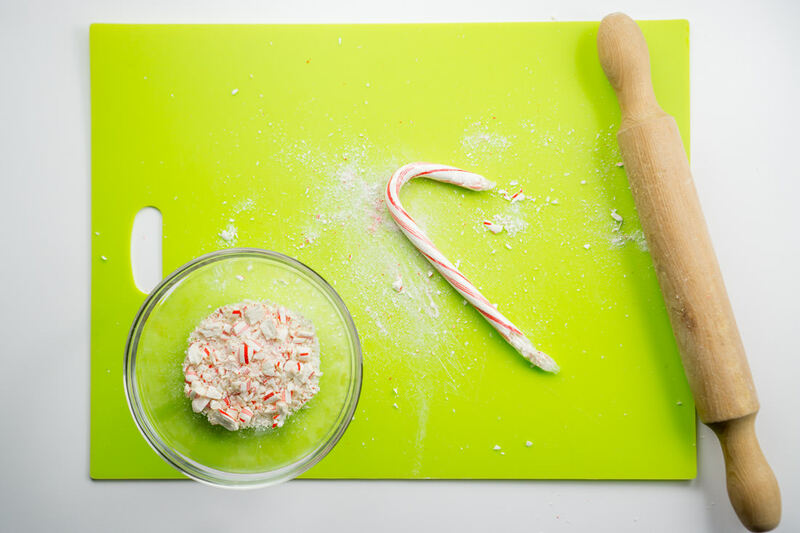 Sprinkle evenly with crushed candy canes. Slice and enjoy. 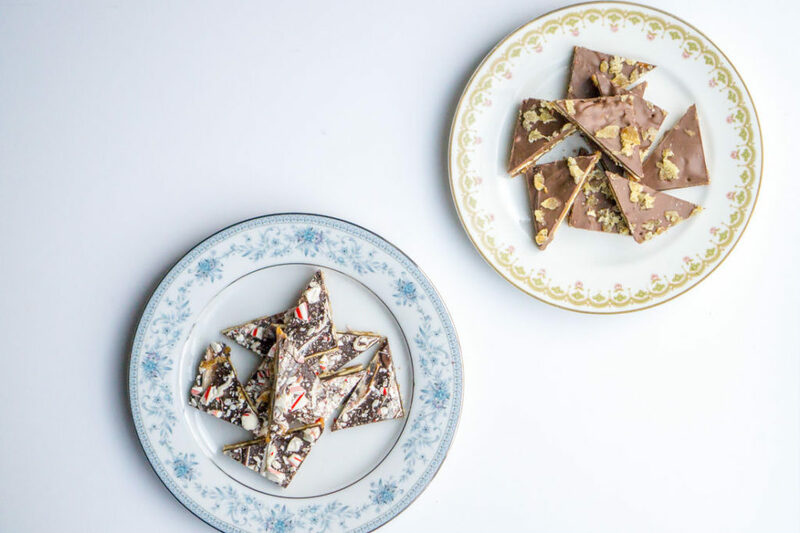 I still have to say, though–the gingerbread version of cracker toffee, especially if allowed to sit for a day to let the spices meld, is my favorite of these two cracker toffee variations. Why? With the buttery cracker, chewy ginger toffee, and mellow milk chocolate topping, it tastes like GINGERBREAD TWIX. And let me tell you–pregnant or not, I LOVE Twix! Preheat oven to 400 degrees F. Line a 12x17-inch jelly roll pan with an extra-long sheet of foil. Spray the foil liberally with cooking spray. 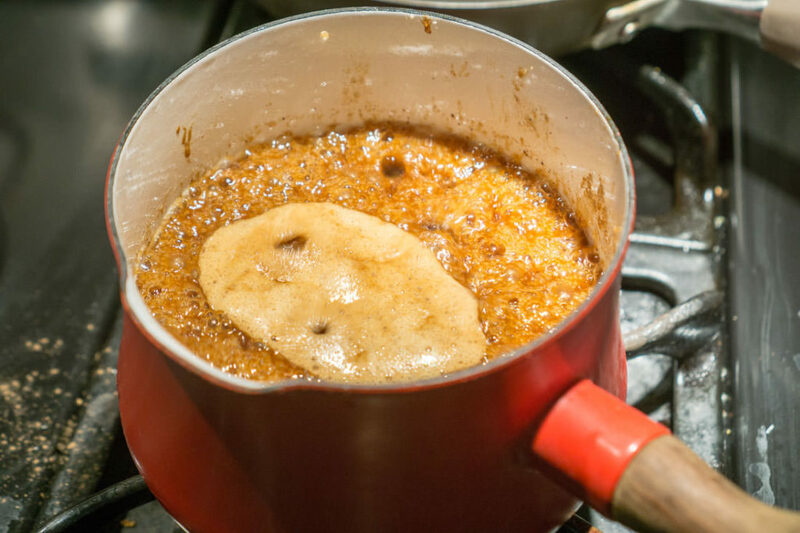 (You can also use a smaller pan, but make sure it has sides, or else the liquid toffee will escape and ooze everywhere in your oven.) 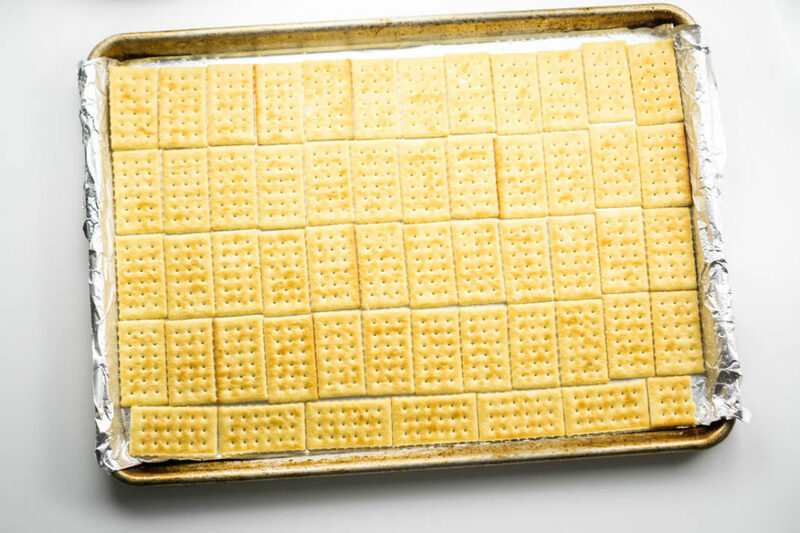 Line up crackers in a single even layer on jelly roll pan--try to fill all the empty space with crackers. To a small saucepan, add the butter, sugar, molasses, ginger, cinnamon, allspice, white (or black) pepper, vanilla extract, and salt. Melt over medium heat, stirring as needed to combine the ingredients. 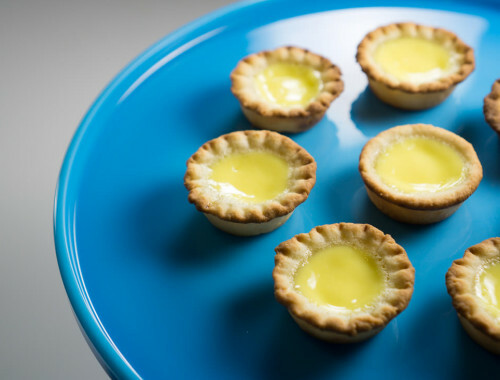 Once the butter is melted, turn up the heat to medium-high and bring to a boil. Let boil, without stirring, for 3 minutes. Pour the butter-sugar mixture over the crackers as evenly as possible. Spread mixture quickly and carefully over the crackers with a silicone or offset spatula, covering all the crackers. Bake at 400 degrees for 6 minutes. Remove cracker toffee from oven. The toffee will be furiously bubbling and the crackers may have shifted slightly during the baking process, which is ok. 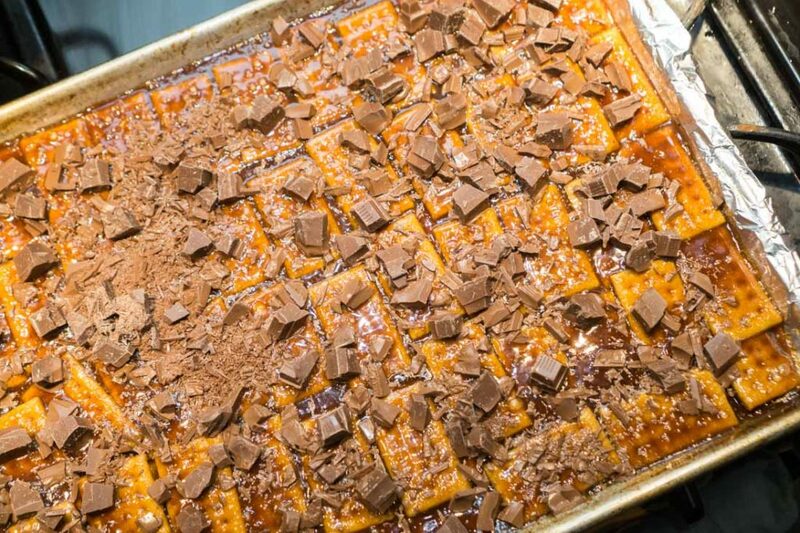 Immediately sprinkle cracker toffee with chopped chocolate. 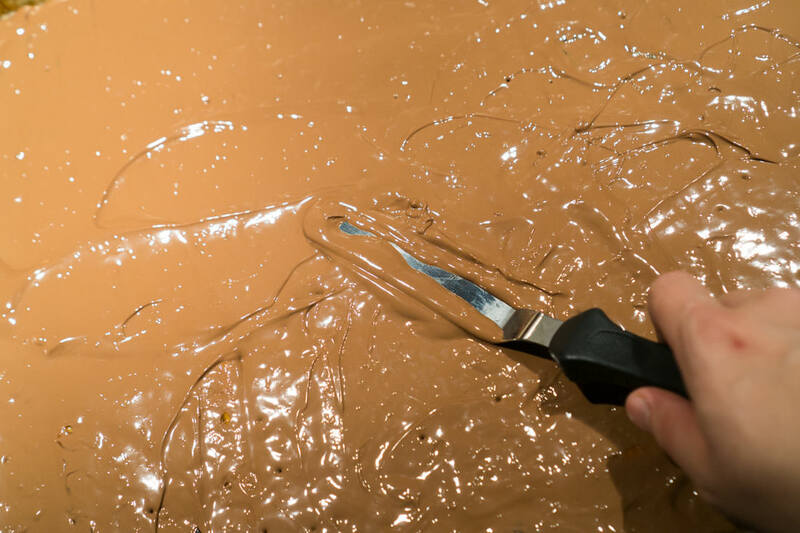 Let sit for 5 minutes or so until chocolate softens from the heat of the cracker toffee, and with an offset or silicone spatula, spread chocolate to cover crackers evenly. Sprinkle evenly with candied ginger. 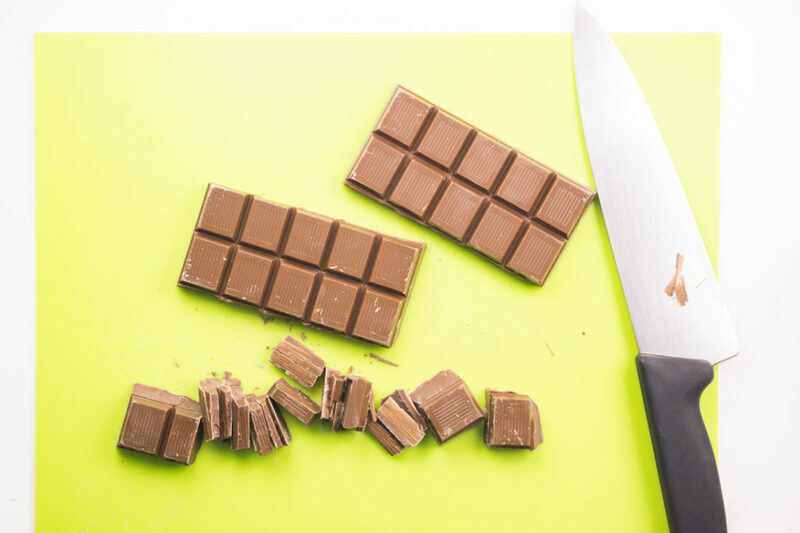 Let cool to room temperature, and refrigerate several hours until chocolate hardens. Remove cracker toffee carefully from pan and carefully peel off foil, checking underside to see that all foil is peeled off. Slice into triangles or squares, as desired. For a Christmas-inspired variation made with dark chocolate and crushed candy canes, omit the candied ginger, ground spices, and one tablespoon of the molasses. 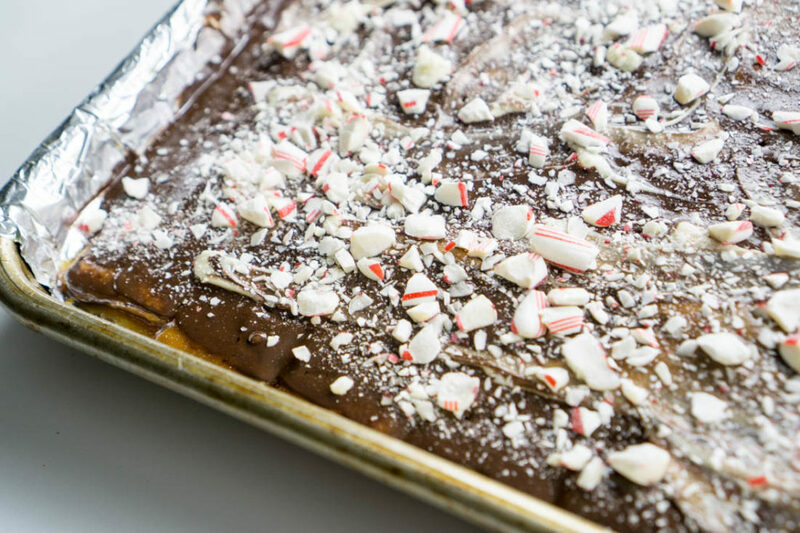 In place of the candied ginger, substitute 4-5 crushed candy canes (or to taste), and in place of the milk chocolate, substitute an equal amount of semisweet chocolate. If you want to get extra fancy, swirl in a few white chocolate chips after spreading the dark chocolate and before sprinkling on the crushed candy canes.